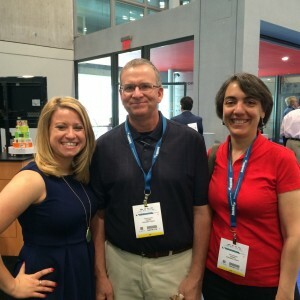 The Wexler Team enjoyed a wonderful show at EastPack 2015. 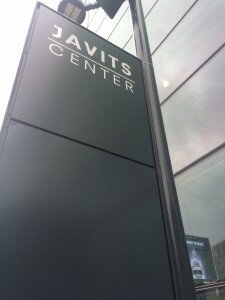 The show was held at the Jacob K. Javitz Convention Center in New York, NY, June 9 -11, 2015. Innovation was the name of the game at EastPack this year. Expo attendees enjoyed access to the latest and greatest innovations and technologies from thousands of top suppliers. 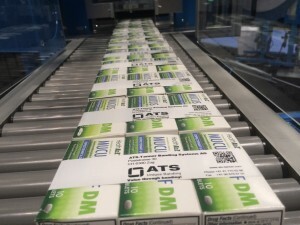 Located in Booth #3003, Wexler Packaging Products showcased packaging and bundling solutions, including the ATS US-2000 CL2-TTP-R. Live demonstrations were conducted daily on this automatic banding system complete with thermal transfer printer, allowing booth attendees to watch as pharmaceutical six packs were bundled with serialization simultaneously being printed directly onto the band (shown right). Ravenwood’s Nobac 500 Linerless Labeling System was also a crowd pleaser at the booth. Visitors from the food industry love the versatility of this sleeving system, which was specifically designed for maximum flexibility and rapid changeover. The Nobac 500 is available in six formats (top, top & side, top & two sides, C-wrap, full wrap and removable sleeve) and inboth fixed and variable weight modes.  Wexler had the privilege of being visited by a number of our customers during the show. We were delighted to see Tom and Ann Krause of Krause’s Candy (shown left with Sales Rep Kristyn Shaner), as well as several team members from LA Enterprises, Ranger Industries, Premier Brands of America, True Science and Contract Pharmacal to name a few. Many thanks to all of our dedicated customers for visiting our booth and showing your support! Wexler will be again exhibiting at EAST PACK 2016, which will be held at the Jacob K. Javitz Center June 14-16, 2016. Please check back at a later time for specific details.